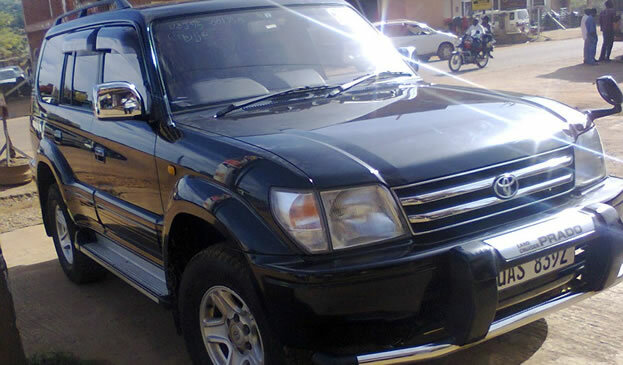 At 4×4 Uganda, we offer a great range of the most affordable 4×4 rental Cars in Uganda and Rwanda. We are the 4×4 rental specialists and can match your needs for a 4×4 rental car to suit any budget. 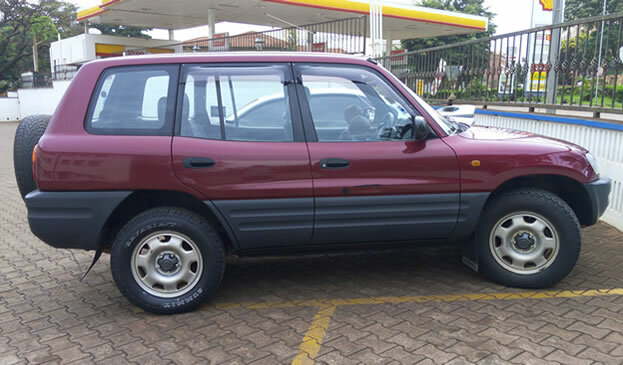 We have cars such as the Toyota Prado (TZ, TX, GX, VX), Land Cruiser Hardtop, Land Rover Defender, Discovery and Toyota Rav4, offered with or without driver (self-drive). 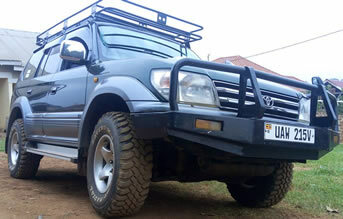 Perfect for self drive safari in Uganda and beyond, available in Manual and Automatic transmissions. Like any other cars we own, its fully insured, with air-conditioner, unlimited mileage, comes with GPS and Road-map. Toyota Prado/Jeep, 3.0 Turbo Diesel Engine, Manual Transmission, with air-conditioner and Pop-up roof for excellent game viewing and photographing, perfect for holiday in East Africa. 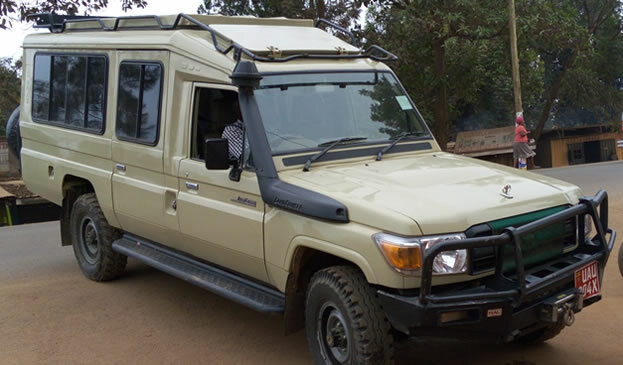 4 Door Toyota Prado, 3340cc Petrol Engine, Automatic Transmission, fully air-conditioned, with a Pop-up roof for excellent game viewing and photographing while on your safari in Uganda and Beyond. We have professional drivers / tour guides from US$30 per day. We have Garmin GPS Navigation with updated East Africa Maps to make your self drive safari memorable and enjoyable! 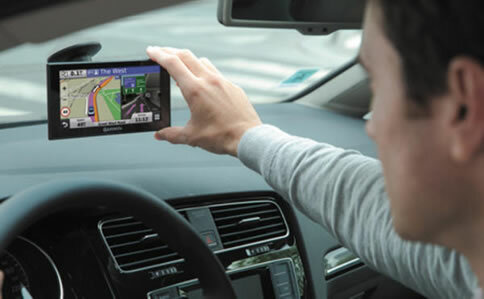 Each car is offered with GPS Navigation. We also have a full camping gear offered at very good price. 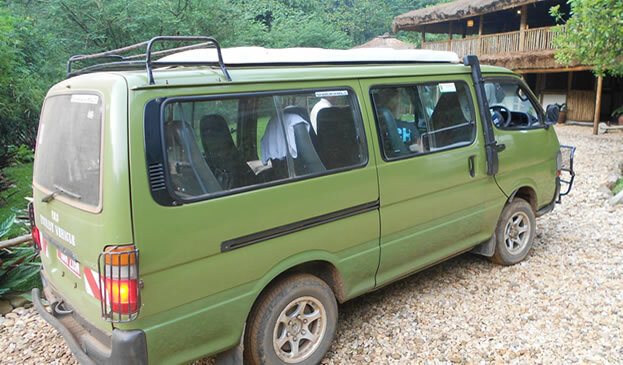 Very good for self drive safari in Uganda, Rwanda, DR Congo, Kenya and Tanzania at the best prices on the Market, available in both Manual & Automatic transmission, air conditioned, low fuel consumption from US$45 per day. 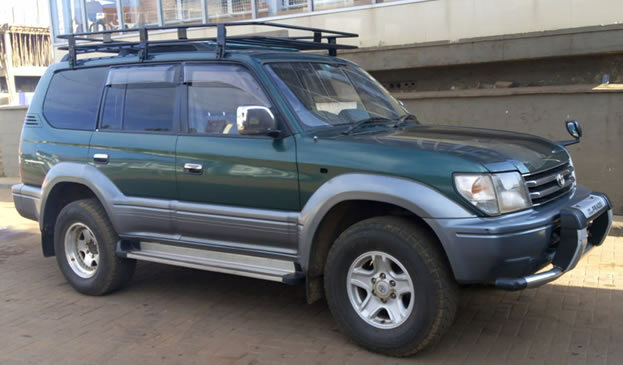 This is a 4×4 Toyota Prado with diesel engine (3.0 Turbo), 2990CC, Automatic Gear, Air conditioner, with a roof hatch for perfect wildlife viewing and photographing, offered with and without driver (Self-drive holiday). We have Toyota Super Custom and Hiace, available in Manual and Automatic transmission, air-conditioned, with pop-up roof, suitable for groups and family vacation in East Africa. 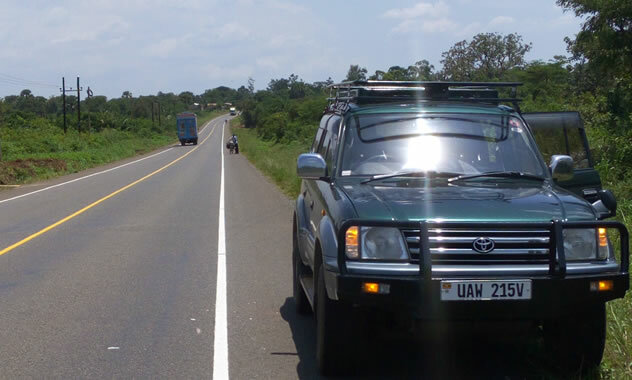 Our Vans have raised suspension to enable you drive any where on our bad roads in Uganda. Toyota Land Cruiser Extended, perfect for family vacation in East Africa, comes with a mini-fridge, unlimited mileage, driver and air conditioned. This is suitable for group tours in Uganda and beyond. All of our rental vehicles are fully insured, well maintained and regularly serviced by professionals. Whether you need to hire a 4×4 vehicle to go off road (for a safari in East Africa), or just to get a higher view of the roads on vacation or for business, our range of utility cars and prestige 4×4’s means we can cater for all your interests. 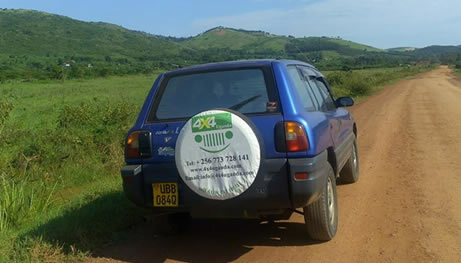 Why Rent A car With 4×4 Uganda? 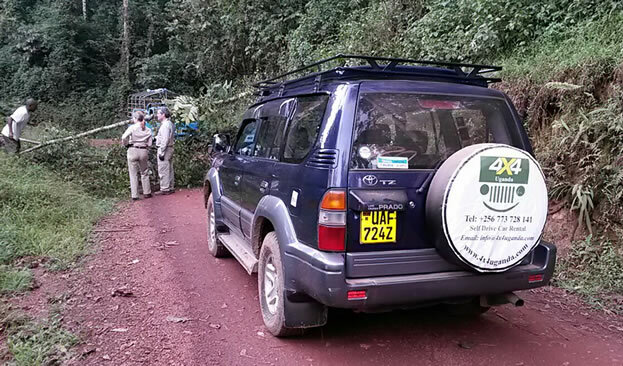 Our 4×4 rental cars are well maintained and regularly serviced by professionals to avoid any inconveniences while on your trip around East Africa. It is now 6 years, we are in self drive car rental business in Uganda and Rwanda! Our experts fully inspect and test our cars before and after every trip.Our professionals listen to the car and deal with any car maintenance problems immediately. We are alert for changes in performance, sounds and visual tip-offs that indicate service or repairs may be needed. How we prevent problems from happening? – Check engine oil/coolant/brake/clutch/windscreen washer fluid levels. – In parking, walk around the car checking all lights and indicators are operating. Cars can be delivered anywhere in Uganda and Rwanda (Terms and Conditions apply). Delivery to Entebbe Airport or hotels around Kampala / Entebbe is free. The renter can return the vehicle to our offices, or have it picked from the airport or from your hotel.